Buffalo Springs Lake, Lubbock County, Texas. Knowledge of the springs was, of course, known to the various Indian tribes who used it. In the 1870s it became known to the buffalo hunters. In 1877 a dugout residence was built by the Causey brothers and their relative stability attracted ranchers and settlers. The springs had been on the S.I. 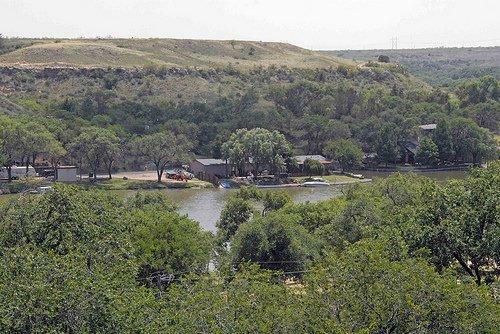 Johnson Ranch. In the late 1920s, the Buffalo Lakes Association was formed when J.A. Wilson dammed the canyon. 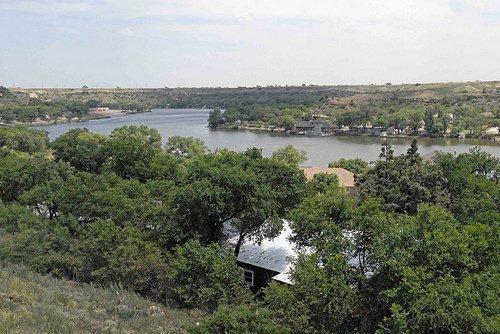 After this initial development, boating, fishing, camping, and swimming attracted visitors and in the late 1950s, Lubbock County Water Control and Improvement bought over 1,600 acres around Buffalo Lake. The springs continue to flow, despite being inundated by the lake. As Lubbock waters its lawns, the water then settles into the aquifer – recharging it and therefore recharging the flow of the springs. A million people are said to visit the lake each year.